Owners of the new Nexus 5 got a head start with the new Hangouts app that integrates SMS and MMS messaging into the conversation, but now the update is spreading to other Android devices. Hangouts 2.0 rivals Apple's iMessages app, allowing Android users to finally import, send and receive text messages in Google's native chat app. It's available for devices running Android 4.0 and above. Like it or not, it also adds animated GIFs to the mix, "cute kittens and all," joked Google in the app's official release notes. Optional perks include the ability to share your location, what device you're on, whether or not you're on a call, and your current mood. 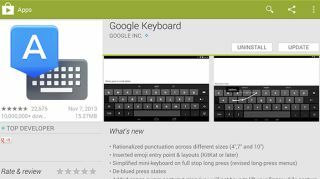 When writing an SMS or sending a standard Hangouts message, Android users can type it out the updated keyboard. The new Google keyboard, also reaching version 2.0 coincidentally, tries to out-cute Hangouts' cat GIF ability with quick access to emojis. So far this new button is only available to devices running Android KitKat 4.4 and above. Emoji frowny face, for sure. Turn that frown upside down, as all Google-powered devices are included when it comes to the new keyboard's other perks: space-aware gesture typing and a simplified mini-keyboard. Both updates should appear in the Google Play store for all Android users with compatible phones and tablets. Speaking of free updates, read our OS X 10.9 Mavericks review.